UPDATE (5/13/13): The first Upper Deck autographed Jack Hoffman card made available to the public sold on eBay last night for $6,100. After bidding was complete, a total of 66 bids were accepted. When Upper Deck announced they were making a special Jack Hoffman football card, it instantly became one of the most talked-about card of the year as it reached a massive mainstream audience. And for all the right reasons. It wasn't about a gimmick. It wasn't about value. It was about people wanting to capture a special moment. It was about a good cause. It was about support. The first of three autographed Jack Hoffman cards has been listed on eBay. And the bids are flying in. Within a couple of hours of being listed, bidding had already passed $1,000. All proceeds from the sale of the card go to the Team Jack Foundation to fight pediatric brain cancer. The over-sized card measures 13.5" by 19" and has a neatly printed autograph from seven-year-old in silver ink. According to the item's description, the non-traditional card is done with foam board and not regular card stock. It also has a blank back. 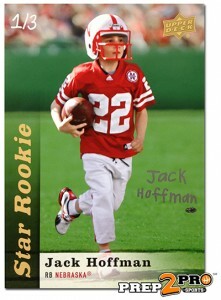 The design uses the 2013 Upper Deck Football design, designating Hoffman as a "Star Rookie." The auction for the autographed Jack Hoffman Upper Deck card runs for ten days. It is scheduled to close on Sunday, May 12 at about 10PM EST. The sale is being coordinated by Prep 2 Pro Sports, a card shop in Norfolk, Nebraska that has been doing lots of work with the Team Jack Foundation. Prep 2 Pro Sports is also including a certificate of authenticity. Besides the autographed blow-up card that got it all started, there is also a Upper Deck Jack Hoffman card that isn't autographed available through the Team Jack Foundation. The cost of each card is $10. Jack Hoffman, who is battling brain cancer, gained international attention when he entered the Nebraska Cornhuskers Spring Game and proceeded to run a 69-yard touchdown. Nebraska's Rex Burkhead, who was just drafted by the Cincinnati Bengals, helped make it happen after striking up a friendship with Hoffman. 2013 Upper Deck Quantum Factory Sealed Football Hobby Box Le'Veon Bell RC ? ?